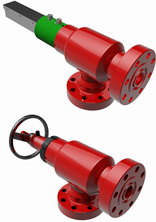 Available in manual or hydraulic designs, the AXON Type 31 Drilling Choke has a standard cylindrical orifice gate and seat design. The gate and seat are solid tungsten carbide, which are reversible for two complete seal and wear areas. In addition, body configurations, gate and seat designs are interchangeable between the manual and hydraulic choke, allowing flexibility in choke and kill manifold designs.